This premium art set includes a wide variety of art supplies for drawing, painting and more – it’s a great choice for kids and adults to experiment with an assortment of artistic media at a value price! 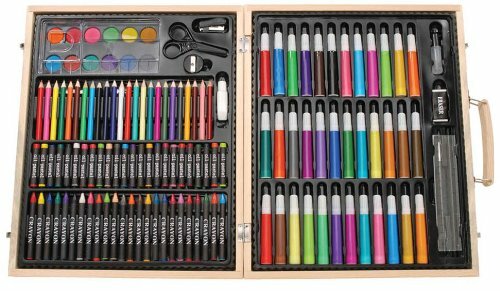 This 131-piece art kit includes: 36 markers, 24 crayons, 24 color pencils, 24 oil pastels, 12 watercolor cakes, and 1 of each: palette, paintbrush, pencil, sharpener, stapler, eraser, ruler, glue and scissors, all in a wood case. A wood case with a wood handle and mental hinges and closures holds all the art supplies and keeps them neat and organized. This art set provides hours of artistic fun and makes a great gift for kids and adults alike.